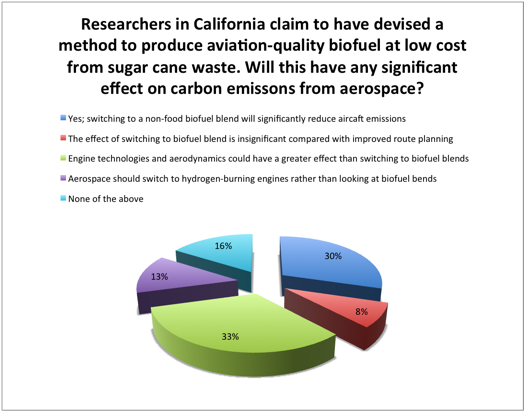 Researchers in California claim to have devised a method to produce aviation-quality biofuel at low cost from sugar cane waste. Will this have any significant effect on carbon emissons from aerospace? Some scepticism about the benefits of aviatiom biofuels was on display in the results of last week’s poll. Of the 280 respondents, the largest group, a third, thought that improvements in engine technologies and aerodynamics would have a larger effect on emissions than switchimg to a biofuel blend, although only slightly fewer, 30 per cent, thought that biofuel blends could significantly reduce emissions. 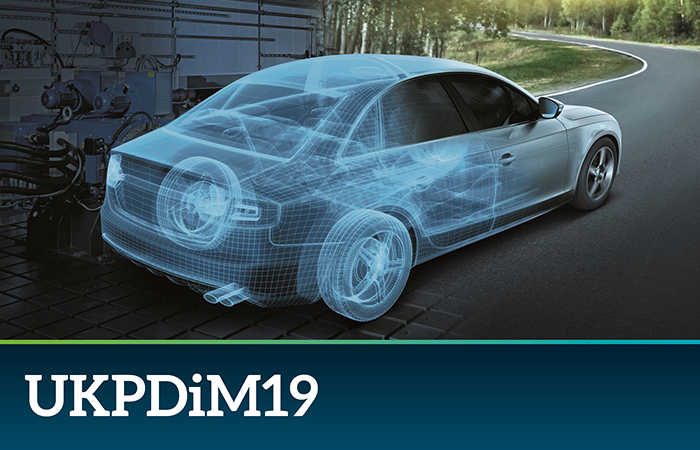 Another group, 13 per cent, thought switching to hydrogen enginmes would be more fruitful, while 8 per cent favoured improving route planning. Several commenters expressed concern that the ‘waste material’ from sugar cane production used to makre buiofuel might not be waste at all, but already used as fuel to power the sugar refining process or composted and ploughed back into the ground as as fertiliser. Quite a large proportion, 16 per cent, declined to pick an option. Please continue to lety us know your opinion on this topic. More nonsense about biofuels! Two years ago biofuels from Barbassu nuts, then palm oil were about to transform aviation into a low carbon transport system. And what happened to waste cooking oil? Moving heavy objects on land, on water and through the air demands lots of energy. Only fossilised biomass, oil, gas and coal, which is solar energy stored as chemical energy and built up over millions of years, is plentiful enough to move vast numbers of metal objects around the surface of the planet. Biofuels are just current solar energy, captured using photosynthesis at 2% efficiency. And using masses of land and water. It’s impossible to replace tens of millions of years of stored solar energy with one year’s crop. And I thought sugar cane waste (bagasse) was already largely used as a source of heat for sugar processing on the plantation? We need to see a study on the complete sugar cane cycle. e.g. if we don’t put the waste materials back into the soil we probably need to produce and apply more fertiliser. The UK uses ~240000 barrels of jet fuel per day. At ~36MJ/L this is equivalent to ~5.0E17 J/year in energy terms. The article doesn’t tell us how many J/year are available from the waste, how much energy is required to convert it into useful fuel, or what the cost of that fuel would be. However a population of 60 million consuming 2200 kcal/day equates to ~2.0E17 J/year. If sugars make up 10% of our energy intake they contribute ~2.0E16 J/year. This is ~4% of the total aviation requirement, and not all of it comes from cane. There isn’t enough information to make a definitive statement but unless cane sugar production is very wasteful and the conversion process very efficient then it seems this can make little difference to aviation fuel consumption. Couldn’t disagree with Robert Palgrave any more, as engineers it’s our responsibility to invent, create and find solutions to some the the worlds major problems, of which pollution is right up there as one of them. A combination of bio-fuels and hybrid technology is certainly a way forwards for all forms of transport, not just aircraft. Especially when you consider the amount of unused land and desert’s which could be cultivated and used productively if covered with large domed structures, which identically would provide stable economies for some of the poorest countries in the world. It will require an enormous amount of material and this is likely to result in more deforestation or, worse still, depriving poor people of low cost food – as as already happened. The reduction in CO2 is likely to be minimal or negative. But all CO2 dose is promote the plant growth that biofuels need! What do we want to use biomass for? We engineers are called on to find solutions to reduce our global and personal energy consumption to a really sustainable level! Without detracting from the question actually posed in the questionnaire (always read the question twice before answering and all that) and under the full understanding that this is not the question the poll was asking but ideally a collaborative approach involving most of the elements identified would be best.